Chief minister Sarbananda Sonowal presented the Republic Day Journalism Award to veteran journalist Dhirendra Nath Chakraborty on Saturday. The award was presented at the central celebration of 70th Republic day of the State government at Veterinary College playground at Khanapara. The award introduced by the Information & Public Relations Department in 2017 carries a citation, a japi, sharai, gamosa and a cheque of Rs. one lakh. Sonowal offered floral tribute to the martyrs at the martyrs’ column at Shradhanjali Kanan in the city. He also offered floral tribute at the portrait of Dr. Bhupen Hazarika at the venue. The chief minister speaking on the occasion urged the people to work with compassion for the humanity at large. Stating the 70th Republic day very significant for Assam due to the Union government’s decision to confer Bharat Ratna on Dr. Bhupen Hazarika, Sonowal thanked Prime Minister Narendra Modi for fulfilling a long standing demand of the people of the state. Moreover saying that the Government’s decision to confer the highest civilian award of the country to the maestro makes the people of Assam happy and proud, Sonowal made a call to the people of the state to follow his humanitarian values and work for humanity with compassion and commitment. 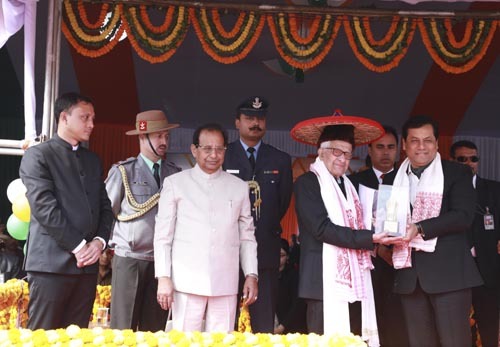 Sonowal also congratulated eminent physicist Dr. Illias Ali and innovator Uddhav Bharali, who have also been conferred with Padma Shri Awards, on the occasion.